Price Tip: If you hate negotiating and still want the best possible deal, always price shop online first. We recommend Car Clearance Deals, MotorTrend, CarsDirect and Edmunds. These free services will offer you the lowest prices on a new Subaru and supply you with multiple competing price quotes. You will know the best price before you visit the dealer. 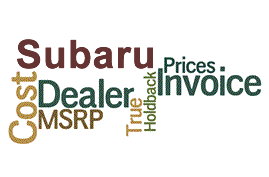 Most people mistakenly believe that the Subaru Invoice Price reflects what the dealer paid for a new vehicle - The true Dealer Cost. It is not! Knowing the dealer cost of a new Subaru gives you needed leverage when it comes time to negotiate a great price. Negotiating from the cost up and not the MSRP down can save you thousands on your next purchase. MSRP is short for the "Manufacturer Suggested Retail Price." As its name suggests, this is the baseline price that is recommended by the manufacturer of the vehicle, though the actual price that the dealer charges will vary slightly. Dealer Invoice: The dealer invoice, on the other hand, is the amount of money that the car dealership is required to pay the car manufacturer in order to receive the car. Dealer Holdback: The dealer holdback is a token amount of money that the car manufacturer provides the dealership with in order to ease the costs of buying numerous vehicles and waiting for them to sell. Regional Ad Fees: Regional advertisement fees are fees that the dealership pays the car manufacturer for any local advertisements, commercials, and promotions that the manufacturer runs which benefit the dealer. 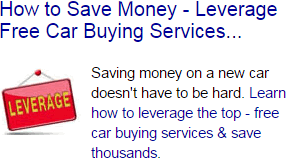 The advertisement fees that the dealer has to pay are just a small portion of the total cost of these ad campaigns. Destination Fees: The destination fee is a small amount of money charged by the car manufacturer to cover the cost of delivering the vehicle from the actual factory to the dealer's showroom. Manufacturer Incentives and Rebates: Manufacturer incentives and rebates are measures taken by automakers to encourage buyers to purchase some of their slow-selling vehicles. Each of these terms will play a small roll in the final cost of your new car. By arming yourself with the right knowledge, you can walk into the car dealership with confidence and make a purchase you will be happy to live with for many years to come. Base Subaru Invoice Price + the dealer Invoice price of Options + Destination - Holdback = Total Dealer Cost.